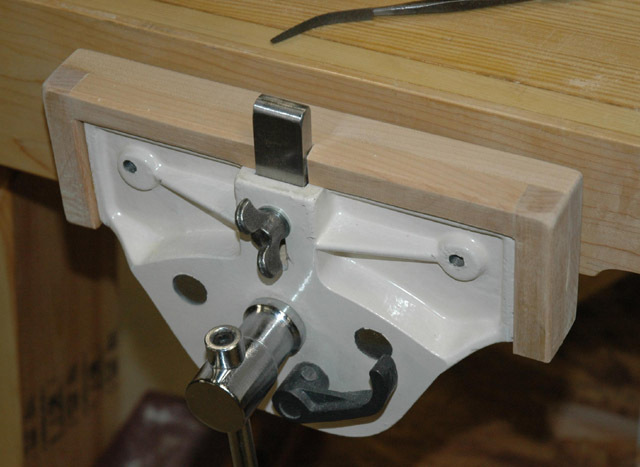 When I was VERY young (4 or 5) my Dad had a big American or English made version of this vise on a bench. I was short enough to walk under the tall bench and admire the ingenous quick adjustment mechanism and pull the lever from undeneigth and see it working. I remember the heavy iron and steel parts well and that was undoubtedly a much stouter vise than this Chinese import. That vise and bench along with a big old flat belt drive drill press didn't make the move from Kentucky to Virginia. . . something to do with not being classified "household goods" by the movers. . . :( A sad loss for our home shop which would have probably changed my life in some major way. Due to pattern draft neither mounting surface of these vises is square to the jaws and thus must be inletted or shimmed square to the bench. I opted to inlet the vises. I also did not want the metal edges sticking above (or being flush) with the surface of the bench. So the front edge of the bench was doubled to 3" thick. 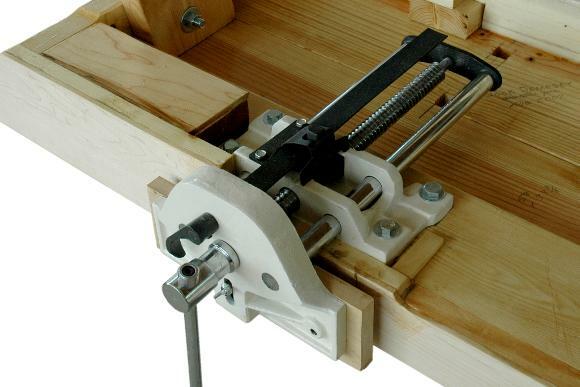 I inlet the front jaw of the vice so that a wood face that continues down the front of the bench would be the back jaw. Instead of spacing the vice on a 1" (25mm) board added to the top, I bolted it to the 2x6 that is glued to the 2x12 top board. This increased the depth of the vice about 5/8" (16mm). Due to pattern draft the jaw face inletting is about 9/16" (14mm) deep at the bottom and 7/16" (11mm) at the top. 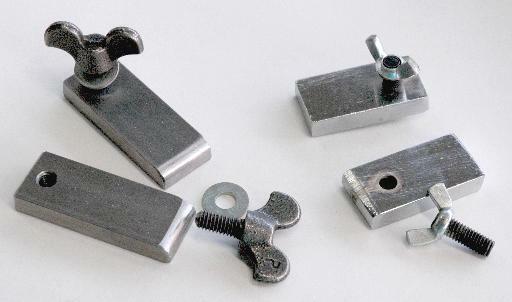 To square the face of the vice to the bench the back bolting pads had to be recessed about 1/16" (1.6mm). This was all hand fit by trial and error. 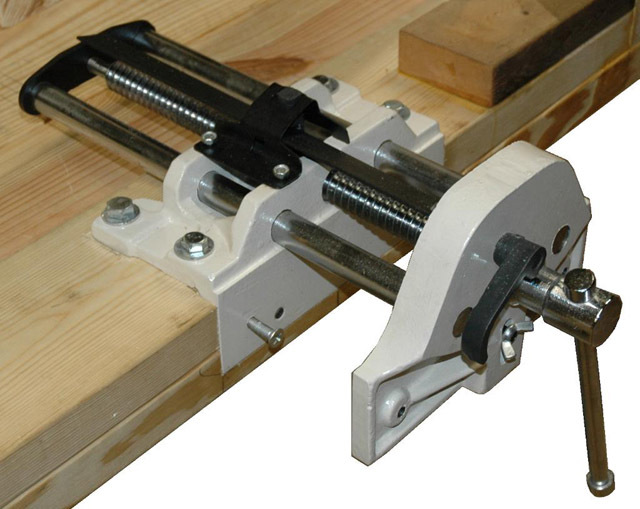 The vice is held onto the bench by four 3/8" x 3" (10 x 76mm) lag bolts and two #10 wood screws. The 3/4" (19mm) facia board was glued to the front of the bench and the two flat head screws held it tight on the vice. These screws were covered by the 1/4" (6.4 mm) hard maple facia board. The vice installation is permanent (without destroying the bench). The finished vice installation with facia boards. The maple jaw cover attached prior to adding the edge trim. After adding the wood lining and edging to the vise the bench dogs were too short. I replaced them with 3/8" x 1" cold drawn bar stock. I also replaced the crappy 8mm OEM wing bolts that were made of set screws with zinc wing nuts glued on with heavy 5/16-18NC versions (that the vise was originally designed for). Besides faux thumb screws this vise has screwed on end caps on the vise handles. ALL vises no matter what the quality had forged end balls not too long ago. The screwed on balls or cylindrical knobs loosen and fall off regularly. Not just on these vises but ALL such vises. If you are looking for quality tools look for forged on vice handle balls. Weight: ~ 30 lbs. each. Woodworking Bench Work benches for craftsfolk.